Written by Nicole Kohler on May 7, 2015 Blog, Social media. If you have social media buttons on your product pages, you probably added them because you wanted your products to be shared more frequently on networks like Twitter, Facebook, and Pinterest. You know that more shares = more publicity, and more publicity = more new customers making purchases. However, increasing those valuable shares isn’t always as easy as sticking a few buttons on your store and calling it a day. Your customers need motivation to share your products, and it’s up to you to give it to them. There are a few methods you can use to motivate a customer to spread the good word about your brand before, during, and after their purchase. Let’s take a look at some ways that you can boost shares of your products on social media and attract even more shoppers. One of the biggest concerns that store owners have about products being shared on social media is that it doesn’t help their bottom line. If your ROI from social media shares is currently low, you may not think that it makes sense to encourage additional sharing, especially when there’s so much more you can do to market to customers at the earliest stage. However, research has found that pre-purchase social shares are strongly linked to revenue. One study from ShareThis showed that millennial shoppers (those born between the 80s and early 00s) are approximately twice as likely to buy a product they’ve personally shared on social media. 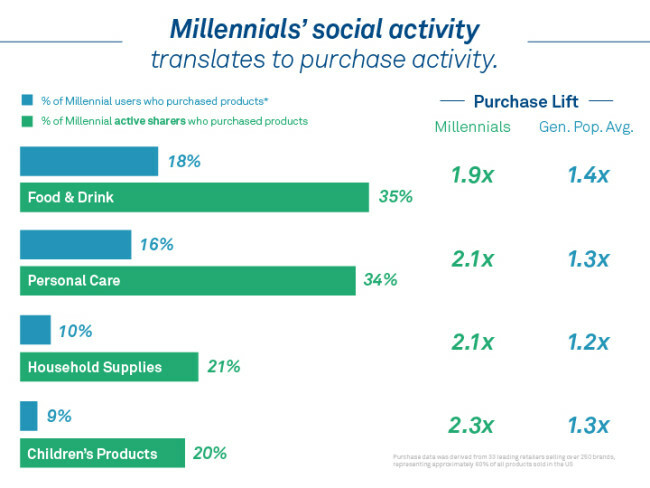 Millennial shoppers who share products are about 2x more likely to make a purchase. Even for non-millennials shoppers, social sharing brings with it a 20 to 40% lift in purchasing intent. Additionally, the ShareThis study shows that millennial-aged friends or acquaintances exposed to shares of your products are more likely to make a purchase from your company. 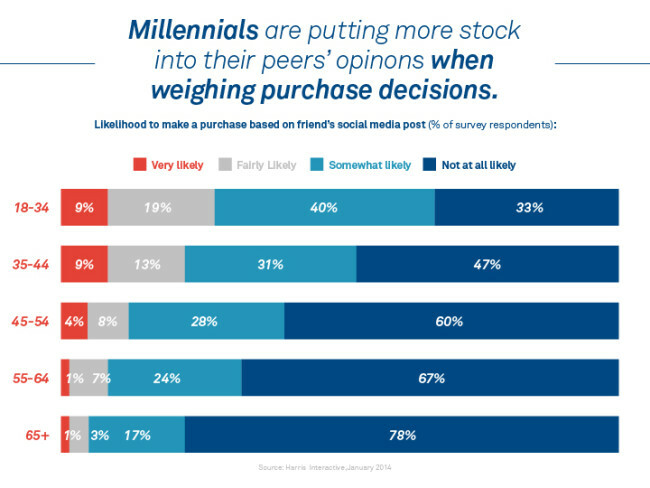 40% of millennials are “somewhat likely” to make a purchase based on a friend’s recommendation on social media. As you can see, there’s immense value in making social sharing easier. Whether it’s so your target customers can add your products to a Pinterest wishlist or just nudge an interested friend on Facebook, these shares can drive additional clicks, further brand awareness, and — of course — sales. So how can you prompt your customers to share your products before they buy them? Start by adding the appropriate social buttons or links to your product pages. This may require using a tool or plugin to generate the proper buttons and links for each page; if you’re using WooCommerce, an extension like AddShoppers or Product Sharing for the Storefront theme can simplify this process. How you display these options is up to you. It’s often best to find (or even create) buttons that match your branding, and position them on your pages in a way that is noticeable and functional yet unobtrusive. Sharing options on the Luvd store. 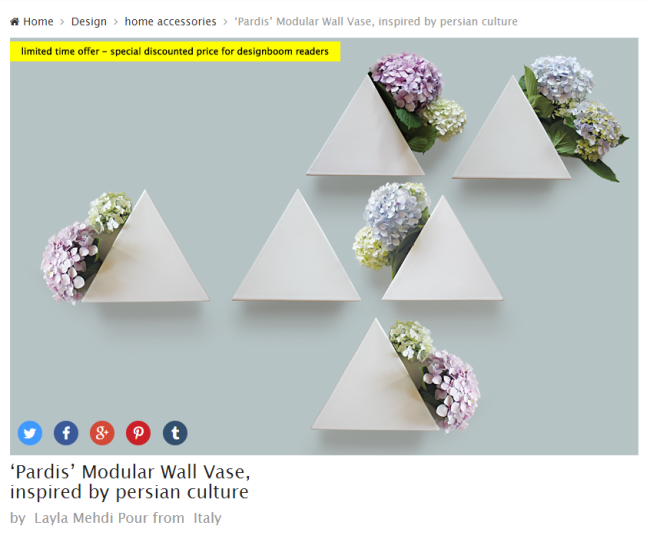 Cool floating share buttons at Designboom. Where should you place your social sharing options? It might take a few tries to find a place that seems right to you. Additionally, you may have to go through a few rounds of A/B testing to determine the location that your shoppers respond best to. Don’t be afraid to try a few options until you find the one that works best for everyone. Finally, keep in mind that your customers may not use certain social networks. If you sell farm supplies, your customers may not find a “share to Pinterest” button useful — but if you sell jewelry, this option is a must-have. Consider removing unpopular options from your pages, as this may cut down on your site’s load time and save a little space. As a store owner, all of your effort is likely placed on getting customers to click that final “buy” button. Once that happens, you can breathe easy, right? Not so fast. If you aren’t asking your newest customers — that is, the ones who have just completed a purchase — to share the products they’ve bought, you’re missing out on an amazing opportunity to tap into their feelings of happiness, goodwill, and self-satisfaction. Consider this: according to a paper published in the Journal of Consumer Psychology, professors from the University of Michigan claim that shopping can alleviate sadness, improve your mood, and make people happier. Additionally, several publications now claim that on social media, positive or happy updates spread faster and are better received than neutral or negative ones. So if you put the two together, you might stand a pretty good chance at getting your happiest customers — that is, the ones who just bought something from you — to effectively spread the word about your store. But you have to ask, and as a 2013 Owned It study found, only 3% of major UK retailers are requesting that customers share their purchases. Just adding the social media links to your “thank you” or “order confirmation” page or email isn’t enough. You should come right out and ask your customers to share the products they’ve just purchased. Note that there are two networks available (Facebook and Twitter), as well as an email option. The title and metadata of the share are both pre-filled, which means the customer only has to click the “Share this item” button to spread the good word about their purchase. 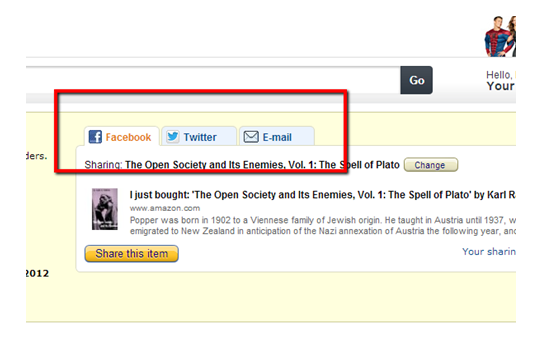 Amazon adds social share options to confirmation emails, albeit much smaller ones. Although the share isn’t explicitly requested here, it’s still an option. Consider implementing social sharing buttons within your confirmation pages or emails as shown above. With metadata pre-filled as it is above, the share is easier since customers won’t have to take any time to write a description. If you support Pinterest, you can try Rich Pins for products to even include details like pricing automatically. Be sure to pair these sharing options with calls to action that will tap into customers’ feelings of post-purchasing happiness. If your store is small or new, you can ask shoppers to “spread the word” or “tell their friends” about you; if you’re larger or well-established, you may have better luck asking them to show off their purchases. Worried that no one will share? You’ll never know until you ask! We’ve covered how to motivate your customers to share your products before they make a purchase, and how to prompt them to share immediately after they’ve completed a transaction. There’s one more time you should consider asking for a share: after their order has arrived. This final request time may vary based on what you sell. If you offer digital goods, like eBooks, it makes sense to ask for shares in an automated follow-up email just a few hours later. 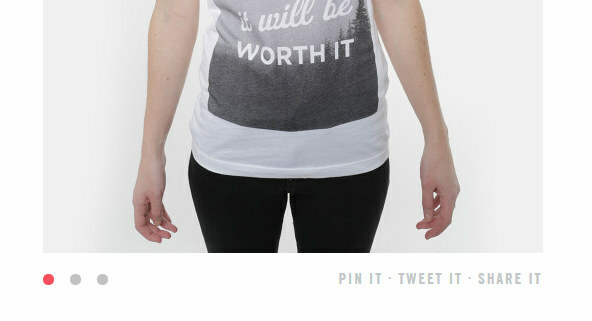 But if you specialize in physical goods, you’ll probably want to wait a few days. This allows time for a customer’s order to be delivered, and for any questions or concerns to be resolved. Why should you ask for shares at this point? Well, your customers are hopefully satisfied with what you’ve delivered, and you can tap into that feeling to ask for a favor. A well-timed follow-up email that politely requests a share is likely to be well-received. Many brands have invested in automated emails that request product or company reviews, and this is one way you may already be tapping into the feelings of satisfaction your customers have with your brand. You already know how important reviews are for motivating future sales, after all. But social shares can be just as motivational for customers who have never heard of you, so why not build upon this same strategy and allow your customers to share the products they are reviewing from the same email? Should you be asking your customers to share your products while they’re browsing your store, after they make a purchase, and when their order arrives? There’s also the possibility that social sharing may not result in positive ROI in one or more of your marketing channels. 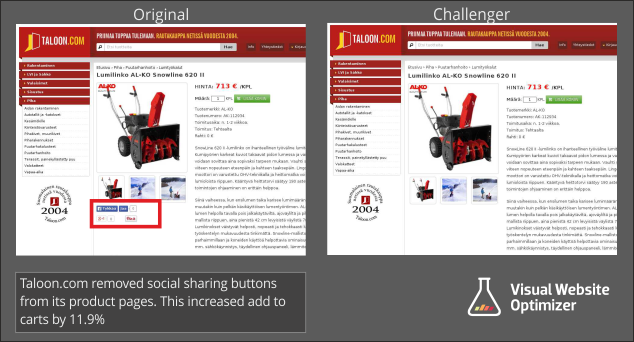 In one A/B test highlighted on the VWO blog, an eCommerce website actually increased its conversion rate when it removed social sharing buttons from product pages. Products were 11.9% more likely to be added to the shopping cart from pages without these options. VWO’s Mohita Nagpal speculates that this was because the number of shares on the store’s products were typically zero, and that worked against them as a negative form of social proof. Because the products had so few shares, some customers might have thought “this must not be very good” and left the page. It’s also possible that the social buttons distracted from the ultimate goal of the product page, which was to motivate purchases. What does all of this mean for you? If you are planning to ask for social shares of your products, start slowly and tread lightly. Don’t ask for shares at every step. Perhaps just start with on-page buttons and a polite request in a follow-up email. You may also want to A/B test the location of your buttons, or even having buttons at all, to ensure that you’re not actually harming your conversion rates in the process. Just as every store is different, every group of customers is different, too. So what works for one store may not work for yours. Be prepared to test, try new things, and ask for feedback on your social sharing options — just as you would with any other new feature. Are you asking for shares? Whether you ask your customers to share from your product pages, show off their recent purchases, or tell their friends about your brand after their order has been completed, social sharing is another method you can use to grow your business. With the right motivation dealt out to your customers, you can increase shares of your products and take advantage of the increased lift in awareness and sales that this publicity brings. Just remember to start slowly and cautiously, and never forget that your customers are doing you a favor! Do you give the option to share your items from your product pages, on your order confirmation page, or in any other unique location? Care to share your results or findings with us? We’d love to hear from you! Good story, but what do you think about this last study saying shame buttons are “useless and unused”? Hey Stephan! Thanks for linking that, it’s definitely food for thought. Like so much in eCommerce, what works for one store may not work for another. So if it’s easy to implement or A/B test something, I say try it!